Dino-Opoly is a dinosaur game based on fascinating prehistoric creatures of times gone by - Dinosaurs. Kids will have all the fun of a traditional property trading game with some prehistoric twists. 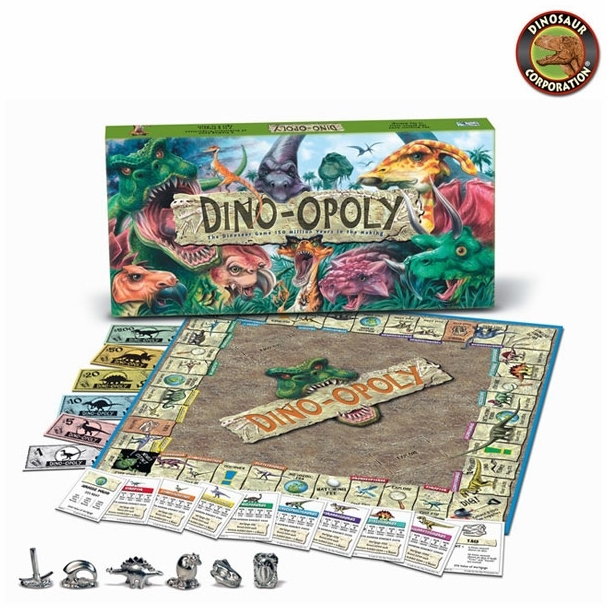 The dino game board features everyone�s favorite dinosaurs from giant-sized herbivores to teeny tiny carnivores. Players trade their Fossils in for Dino Bones to raise the rent. * each Dino Deed features fun facts about that particular dinosaur. * choose traditional play or one hour version board spaces are all dinosaur-related.